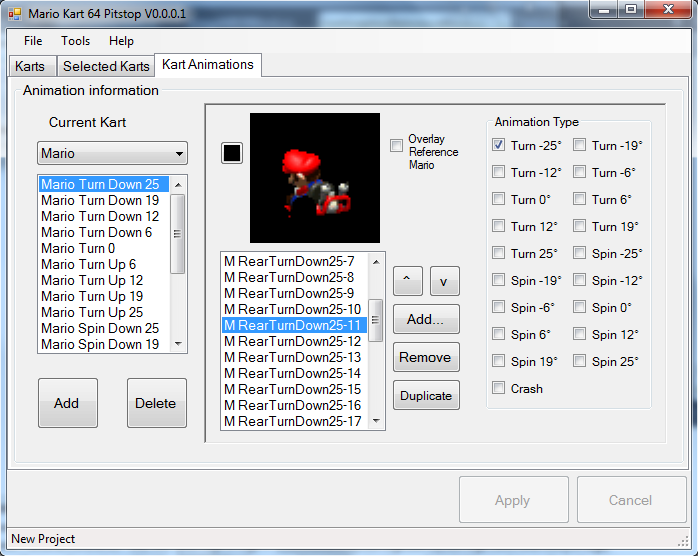 Hey y'all, this is the official thread for the Mario Kart 64 Pitstop tool! A few notes. Development has slowed and pretty much ceased on Pitstop64, due to multiple reasons, not the least of which was my being burnt out. There was the difficulty of dealing with feature creep and bloated projects that I haven't been trimming like I should. And misguided effort on the fundamental base of the program. So rather than making empty promises about *someday* making progress, I'm going to shut down work on Pitstop64. And start working on the next iteration, of course. The foundation of Pitstop64 was built off a library I made called Cereal64, which was based around sectioning the ROM into regions that represent certain types of data, but maintaining the offsets of those regions within the original ROM. Perfect for its original purpose of reading F3D family microcode, but not so much for a ROM which will change in content and size during the editing process. Instead, I'm going to be basing the program off of queueRAM's N64Split, which takes the ROM and splits it up into separate deserialized files, tossing away the original file layout but maintaining an order to recombine the data back into a new rom file. There are multiple benefits from using N64Split, including better assembly support, music data extraction, and more flexibility for pulling this data out. So my plan is to put Pitstop on official hiatus for a bit while I do some work with queueRAM to get N64Split working with MK64 data structures, along with some other goodies (like a working sfx exporter/importer). Then a month or two down the road I'll come back and make a new MK64 editor, and probably copy/paste as much as I can from Pitstop to make things easier. There's also lots of things I've been investigating lately, especially involving the assembly code for the game, that I can finally introduce into the program. And someday, we'll finally have that Course Editor. But for now, I'm going to focus on N64Split. Thank you for your patience, and your enthusiasm so far for this project. I feel that for a while now, I haven't given it the attention it deserves. I want to change that though, and actually finish this project. Thank you this tool is awesome I already made a hack with it check it out. It makes my heart happy to see as MK64 hacking progresses more, Great job on this. There is a transparency issue when I replaced all karts with mario, the tire rims became transparent. Edit: Can you add an auto-image resizer please? I can do this my self with your source but I'm not good with other people's sources. Edit: What about the regular title screen? It's really annoying trying to get the alternate title screen to appear. Yep, wheel palettes are a huge pain right now, so I've decided to leave them to be handled for later. If you mess with the original racers, there's a strong chance you'll have wheel palette errors. Interestingly enough, when I replaced all karts with DK, all the wheel palettes were okay except for my DK, which I think was the Mario one? Maybe Mario's wheel palettes are not very compatible with everyone elses. Quick note, on trying to import some karts, I realized the palette generation code is broken. I'm gonna release 0.0.0.2 tonight to fix that and fix up a few other issues. Don't expect quickfixes to be this quick in the future. Drew, I love your kart! It looks almost exactly like the real racers! I'll be working on all these in some aspect, but I'll push hardest on the one you guys suggest. I have a feeling I already know what the answer will be though, lol. EDIT: RobiNERD brought this up to me, only the US MK64 rom works currently. The next release I'll be looking at the other ROM versions to see how easy or hard it will be to use those. Hey I was planning on making Yoshi Kart 64 where all characters are Yoshi with the different Yoshi colors. I was planning on using the same Yoshi images and just change the colors the only problem is with this tool it seems like you can only export 1 picture at a time and there are around 300 pictures for Yoshi is there any way to export all the images for a character at once?